A new training programme will allow students to receive a military rank without leaving their university. They would then be commissioned in the military reserve force. The Ministry of Defence, Ministry of Education and the Russian Union of Rectors have approved a new training programme for reserve officers, sergeants, and privates that will be offered in higher educational institutions around the country. At the initiative of the president, who was supported by both the military and the Russian Union of Rectors, all students that can pass a physical exam will be able to go through army training at their universities. They will study in the military departments of universities, in military training centres, and in inter-institutional military training centres. After graduation, depending on the program, the student can be commissioned as a lieutenant, sergeant, or private in the reserves. Up until now, only students studying at universities that had a military department or school of military training were able to go through military training during their studies and be admitted to the reserve force with an officer's military rank. However, these departments and schools are found in only a few institutions of higher education. There are only 72 in the whole country. That's roughly 7 percent of all educational institutions. Russian higher education annually admits about 550,000 young men as freshmen, of whom only 10 percent go on to serve in the military. For the Russian army, whose military units are understaffed by 17.3 percent according to official data, this is a very significant figure. If there is a serious armed conflict or a large-scale war that no one wants or is expecting (but from which no one is ever completely safe), untrained and unskilled young men will have to be sent into battle. In other words, they will be "cannon fodder." No one wants to see this. Future reserves of the armed forces will be trained on a voluntary basis in an area related to their university studies. 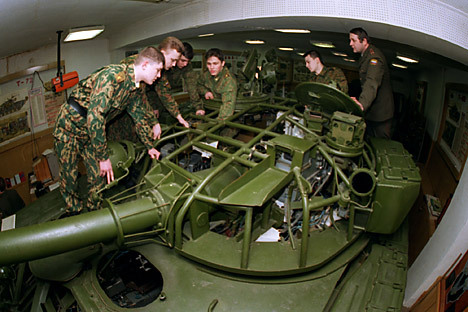 After the students at the military department or inter-institutional centre have studied the theory, they will go through a three-month boot camp the summer before their senior year, where they will be trained on real military equipment intended for their military specialty, and will have to pass an examination. If they pass this test, they will be given a military rank. Those who do not pass the test will be sent to serve as regular conscripts in the army. “This procedure will allow us to prepare the right number of reserves in the areas most in demand, primarily technical military specialties, while not drafting them into the armed forces,” commented President Vladimir Putin on the new training programme. But how this can be achieved if some cities in Russia and even entire regions the size of France or Germany have only one military department? The solution is that the military will create inter-institutional centres for training that will have ties to nearby universities and institutes. These centres will use the training facilities of military schools or military units that are located in the particular region. Students will have a so-called ‘military day.’ In the morning, they will put on their military uniforms, and take a bus or train to an inter-institutional centre. After training for eight hours, with a break for lunch, they will go back home. A week later they will be on the road again. In this way the students will learn all types of small arms, and wheeled and tracked equipment. This new programme for training future officers and sergeants of the reserve forces at military is likely to commence on September 1, 2014. Branches of inter-institutional military training centres are scheduled exactly a year later in military training centres and on September 1, 2016 at military bases. It is easy to see what this reserve training will do for the army. But it is not clear how it will attract students. Although it is true that it would be more appealing to train at a department or in an inter-institutional centre and then go through a three-month boot camp before taking qualification tests and examinations with fellow students than to join the military with strangers. The new programme has another important aspect. When former students with military experience make a career in public service or in a state-owned corporation, no one will be able to accuse them of avoiding military service or prevent them from being promoted. However, there are problems. No one has said anything yet about the fate of these future reserve lieutenants, sergeants, and privates with higher educations. In order to maintain and build upon their knowledge and skills in their military specialties, they should go through at least three-week or month-long training at least once every 18 months. Otherwise, all these expenses (legal, educational, financial, and other) will not be worth a dime. Without a comprehensive system for training and continuing education for the reservists, training students will be only half the battle, if not less.